On 18 August 2016, at 14.00 o’clock at the Academic Library of the University of Latvia (Rupniecibas street 10, Riga) the book donation by The Gorbachev Foundation will take place. 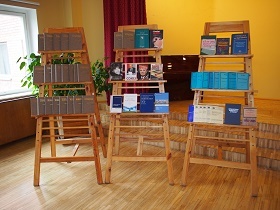 Latvian Academy of Sciences and the Academic Library of the University of Latvia will present to the Latvian researchers and the general public the 65 newly-acquired books from the International foundation for socio-economic and political studies (The Gorbachev Foundation). The book donation includes the collected works of M. Gorbachev which consist of 26 volumes that were published in Moscow in limited edition. There books contain not only the public speeches by M. Gorbachev, but also many materials and documents which were not previously published, including the transcripts of the telephone conversations between M. Gorbachev and the presidents of the USA, Germany, France and other great powers, where the situation in the Baltic republics in 1988-1991 was discussed among other things. The collected works also contain minutes of the meetings of Political Bureau of the Central Committee of the Communist Party of the Soviet Union where the situation in the Baltic republics was discussed. The biggest interest for the researchers and scholars may present the description of the processes, contained in these documents and materials, related to the political crisis in the Baltic republics in January 1991 and the August 1991 coup. Despite the fact that these books do not contain sensational facts, they provide additional information in order to figure out and understand various new and substantial details related to the collapse of the Soviet Union and regaining of the independence of the Baltic States.